Most of the time we are re-running old newspaper columns on this site. But we expect to do some original work as well. That is the case here today. We are publishing the first half of a study we recently did on the geology of the Hyde Park ice age deltas. We hope that you will be able to go to Hyde Park and see what we have seen. We like to bring a barbeque skewer along with us wherever we go. When we want to investigate this sort of flatland we try to drive it into the ground. If there are rocks, which there usually are, we have little luck. But – if the skewer slides in easily – then we have likely found a glacial lake bottom. That is the case at Hyde Park. Take a look at our map. All the yellow is flatland where there are few, if any, rocks in the ground. But, is this a simple lake bottom or is there more to the story? Notice that, on our map, the yellow flatlands lie at the downstream end of a stream with the unlikely name of Crum Elbow Creek. Long ago, glacial geologists recognized that that all these flatlands comprised an ice age delta, sometimes called the Hyde Park Delta, the delta of Crum Elbow Creek. The New York State Museum map of ice age features actually portrays two deltas here, one north of Crum Elbow Creek, with a second and larger one, just to the south. This is important, and we should name the two deltas. 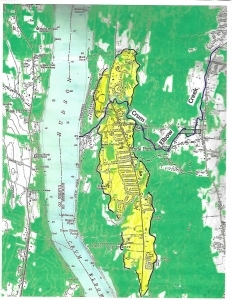 Let’s call the northern one the Vanderbilt Delta (brown) and call the other the Roosevelt Delta (yellow). 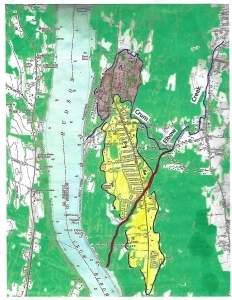 Roosevelt Delta in yellow; Vanderbilt Delta in brown. Back during the Ice Age, there was a sizable lake flooding all of this part of the Hudson Valley. It has been called Glacial Lake Albany. Crum Elbow Creek is a long flow of water and, back then it was likely carrying a lot of sediment. Most of that sediment was deposited as the delta where the creek flowed into Lake Albany. The top of a delta is always flat and it roughly corresponds with the old lake level. That’s called the topset of the delta. That would have been at about 180 feet in today’s elevation. The front of a delta is typically a steep slope called a foreset. That explains another landscape feature that we see throughout Hyde Park. Take a look at our photo from the Vanderbilt mansion. 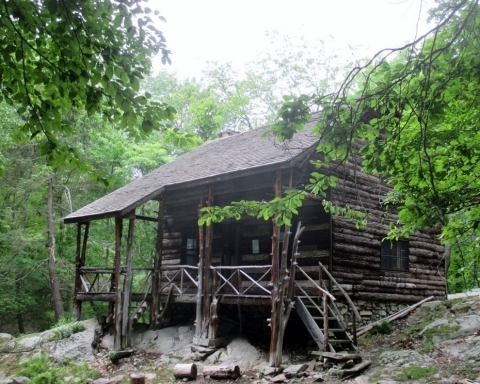 The mansion was located at the top of the steep foreset slope. That offered the Vanderbilt’s a nice view of the Hudson River. Walk north and south from the mansion and enjoy this view. The Vanderbilt Mansion from the south. Below it is the foreset slope. 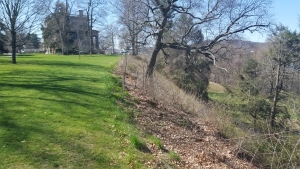 Foreset slope, north of the Vanderbilt mansion, with its view of Hudson. Now we have learned a lot about Hyde Park. You are not likely to be able to pass through town without envisioning yourself in a very different landscape, an ice age one. With your mind’s eye look west and see Glacial Lake Albany spread out before you. It extends all across the Hudson Valley. The lake was almost two miles wide here. That’s about four times as wide as today’s river is. But, the more we worked the area, the more we saw problems that needed to be explained. For starters, we thought the flow of Crum Elbow Creek was a bit odd. The stream has its head about ten miles north of Hyde Park. It flows in a remarkably straight line, just a little west of south, all the way to Hyde Park. Much of the way, it follows Rte. 9G. But then, at the village of East Park, it turns sharply to the west and flows directly into Hyde Park and, from there, into the river (see our maps). Back during the Ice Age, that took it right into Glacial Lake Albany. We wondered if there was a story to that sharp westward turn. We are scientists; again, we are supposed to wonder such things. Then it began to bother us that Crum Elbow Creek did not match the delta all that well. It certainly did a good job of explaining the northern part of the delta, the Vanderbilt Delta. But how was it that the delta spread out so far to the south? How could delta sediments extend a full two miles, south of Crum Elbow Creek? In short we just did not think that Crum Elbow Creek was accounting for the Roosevelt part of the delta complex. Again, we are scientists. That’s when another problem appeared. We were now looking more carefully at the map and we suddenly noticed that, while there were two deltas at Hyde Park, they were also of two different elevations. The Roosevelt Delta, south of Crum Elbow Creek, had a topset at about 180 feet in elevation, but the Vanderbilt Delta, north of the creek, lay at just about 170 feet. We were, clearly, looking at two separate events. Do you have some ideas? That is , before you read the second column – just below. Close-up of the southern delta. This is the second of two new articles about the Hyde Park deltas. Last time, we began investigating the Hyde Park Deltas. These ice age features have been recognized by glacial geologists for decades and they are seen on the New York State Museum’s map of New York State glacial geology. That map recognizes two deltas. But we have found something remarkable and, we feel, revealing. Those two deltas represent two chapters of delta formation. That needs to be explained. So – we are going to, herein, record the sequence of events that we have deduced to, we hope, explain all this. We are, in short, going to record a sequential history of the formation of the Hyde Park Deltas – and thus Hyde Park itself. 1) It all began sometime close to the end of the Ice Age. 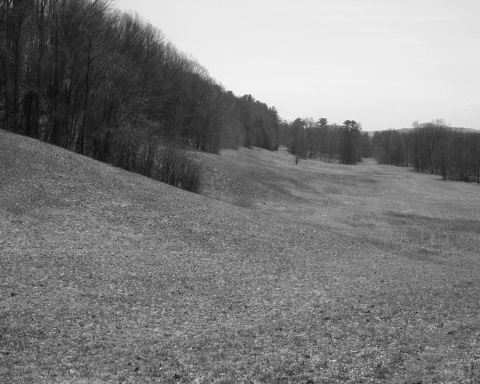 The Hudson Valley glacier had been melting and vacating the valley, and it left behind a sizable lake. That has long been recognized as Glacial Lake Albany. 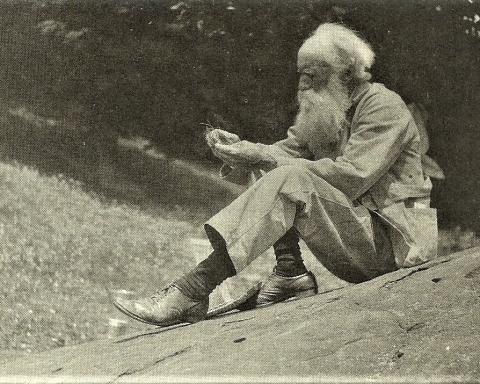 The lake stretched across the Hudson Valley and, at Hyde Park, it was nearly two miles wide. 2) Crum Elbow Creek was flowing south by southwest, east of, and parallel to, the lake. This took it across a newly deglaciated landscape. We suspect that, at least at first, it was a far more powerful stream than it is today. It does not amount to much today, but back then, it may have been swollen with very dirty meltwater. It, we think, it (must) have been a very erosive stream. Crum Elbow Creek today, upstream. 3) If so, then Crum Elbow Creek had to have carried a very substantial load of sediment which came to be deposited in Lake Albany. 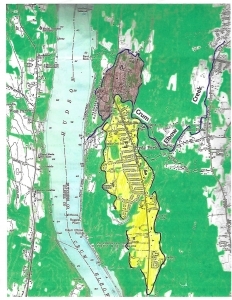 Most of that sediment formed what we are calling the Roosevelt Delta (see yellow on our map). The waters of Lake Albany, at that time, reached a level of 180 feet in modern elevation. The delta’s topset was, likewise, at today’s 180 feet. 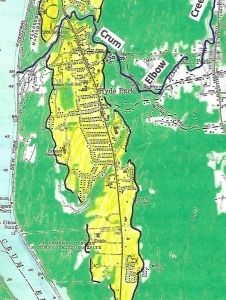 The Hyde Park deltas; Roosevelt Delta in yellow; Vanderbilt Delta in brown. 4) We conclude that, back then, Crum Elbow Creek did not turn sharply to the west as it does today. Instead, it continued its southwest path which took it past today’s Wallace Center and onward, just a little north of the Roosevelt mansion, Springwood. Its old channel can still be seen adjacent to the parking lot at the Wallace Center (see map and see photo). This is the time when the stream deposited the Roosevelt Delta (again, see our map). 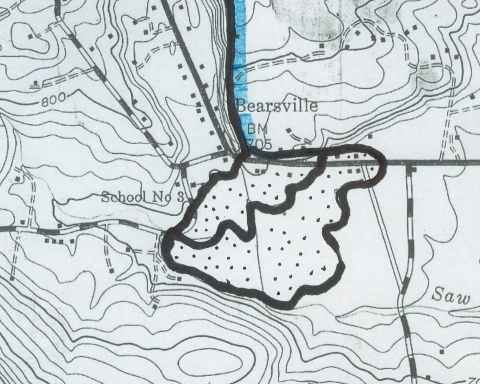 “Old” Crum Elbow Creek, highlighted in red. “New” Crum Elbow Creek (blue) extends off to the west. Now dry channel of “Old” Crum Elbow Creek, just north of Wallace Center. “Old” Crum Elbow Creek once flowed at the bottom of this small valley. 5) Next, there came a time when Lake Albany (suddenly?) drained down to a level of 170 feet. We do not know why, but with that lowering, a remarkable event ensued. A small stream, one that had just begun flowing along the northern edge of the Roosevelt Delta, became quite erosive and, by headward erosion, it worked its way up along that northern flank of the Roosevelt Delta. Stream piracy was now occurring. The path of this stream, “New” Crum Elbow Creek, can be followed along East Market Street (aka County Route 41). It can be seen that this stream had been erosive enough to cut down into the bedrock there (see our photo) and create something of a canyon. 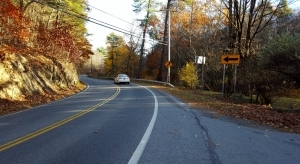 East Market Road follows canyon of “New” Crum Elbow Creek. 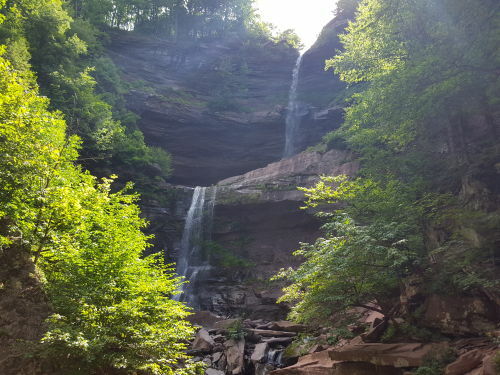 The creek is just out of sight on the far right; it presumably cut the steep slopes of this canyon. 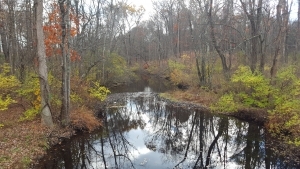 6) With time, this growing creek would intersect “Old” Crum Elbow Creek and divert its waters into the present-day path of “New” Crum Elbow Creek. Also, a new delta, our “Vanderbilt” Delta, began to form. This younger episode of delta building apparently did not last as long as the previous one, and the new delta never got to be as large as its predecessor. The old Roosevelt Delta leveled off at 180 feet; the new Vanderbilt one at 170. 7) During the period of stream piracy, “Old” Crum Elbow Creek continued flowing in its old path. But that path was about ten feet higher above the new level of Lake Albany. This higher level promoted active erosion of the “Old” Crum Elbow channel. 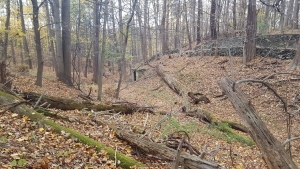 This old channel is the one visible just north of the Wallace Center parking lot. More of the old channel can be traced through Hyde Park. 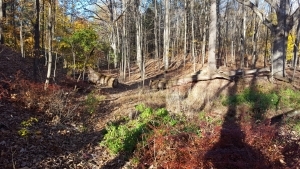 More channel of “Old” Crum Elbow Creek (left center) on the Yellow Trail at the Winnakee Nature Preserve, just north of Rte. 9. 8) After stream Piracy was complete, the “Old” Crum Elbow channel was left high and dry as is seen at the Wallace Center today (our photo, above). 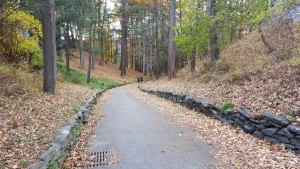 Another dry channel can be seen immediately north of the old Roosevelt family stables. (See our photo below). That had been a tributary of Old Crum Elbow Creek. Dry canyon of a tributary of Old Crum Elbow Creek, just north of Roosevelt family stables on the Cove Trail. Sometime later, Lake Albany dropped the remaining 170 feet, down to its present level. Today’s “New” Crum Elbow Creek came into its modern form by eroding those 170 feet. This is best seen where the bridge crosses the creek at the south end of the Vanderbilt Estate. Crum Elbow Creek at the Vanderbilt Estate. We believe that this history accounts for pretty much all the landscapes we see, today, at Hyde Park. It is an account that describes the very origins of Hyde Park itself and is thus a fascinating history. 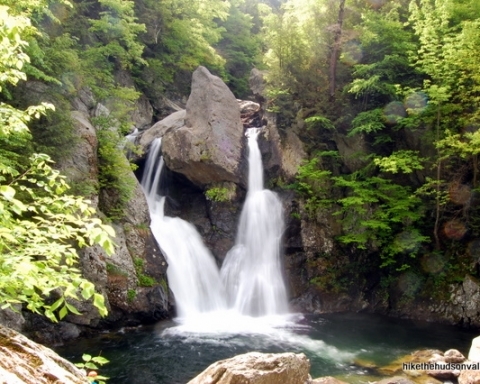 We invite you to tour the town and see the geologic sites that we describe here. Then, take Rte. 9, north and south of Hyde Park, and see what the vicinity would have looked like if the deltas had never formed. We have long been impressed with how ice age events explain so much of what we see in our scenic Hudson Valley. This is a fine example.